If you are getting a notification that you have a number of articles in your queue, but none of the content is showing up, this is most likely because the content is expired. If you would like to view the expired content, you can go to the top righthand corner of your screen and click on the orange filter icon. This will give you a number of options on how to filter your content. You will want to go all the way to the bottom and check the box that says "Include Expired Content" and then apply the filter. This will allow you to view all articles in your queue even if they are expired. 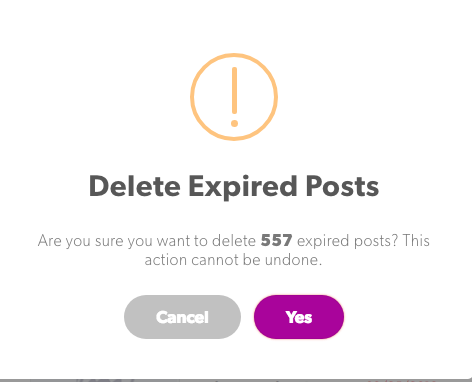 However, if you have too many articles to look through, or just want to get rid of them all, you can now bulk delete all expired articles in your queue with the touch of a button. Once clicked, you will be asked to okay the deletion of all expired articles in your queue. Click "yes" and you are good to go! Now your queue is free of clutter and ready for a new batch of exciting content to be approved!